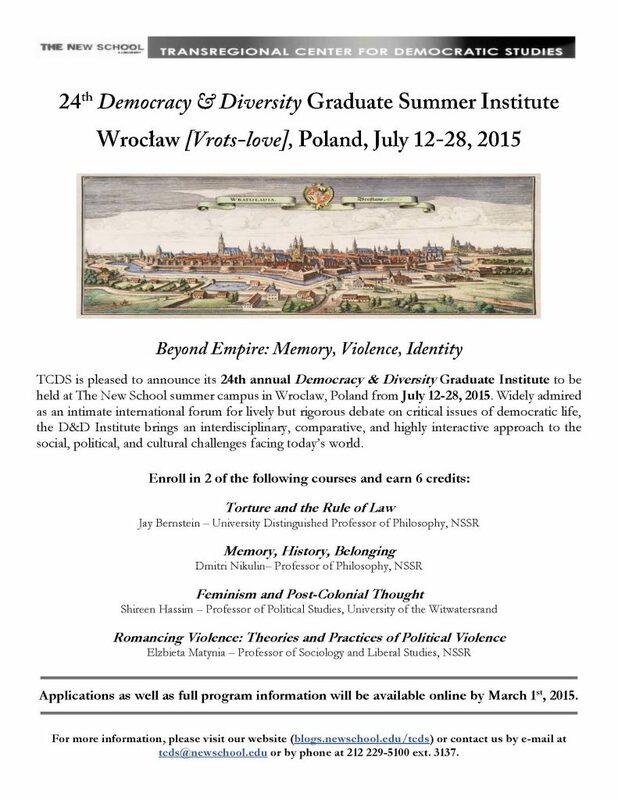 TCDS is pleased to announce its 24th annual Democracy & Diversity Graduate Institute to be held at The New School summer campus in Wroclaw, Poland from July 12-28, 2015. Widely admired as an intimate international forum for lively but rigorous debate on critical issues of democratic life, the D&D Institute brings an interdisciplinary, comparative, and highly interactive approach to the social, political, and cultural challenges facing today’s world. This years Institute will be themed Beyond Empire: Memory, Violence, Identity. Applications as well as full program information will be available online by March 1st, 2015. For more information, please visit our website (blogs.newschool.edu/tcds) or contact us by e-mail at tcds@newschool.edu or by phone at 212 229-5100 ext. 3137. ← Democracy & Diversity Institute, Johannesburg 2015 Guest Speaker William Gumede Featured on Public Seminar!